Data released from the World Health Organization on air pollution (ranked by PM2.5) indicate that these cities are the worst of the worst. Fossil fuel power plants that transmit fumes are a contributing factor to urban pollution. A city in China’s pollution belt of the Hebei province, Baoding is the 10th most polluted city in the world with a mean annual fine particulate matter concentration (PM2.5) of 126 micrograms per cubic meter in its air, well above the permissible limit of 60 micrograms per cubic meter as per World Health Organization (WHO) recommendations. For the citizens of Baoding, a glimpse of the clear blue sky is a luxury these days. Thick smog envelops the atmosphere of Baoding on a regular basis. The heavy flow of traffic in the city, various industries operating within it, and smoke and dust generated from coal-fired steam boilers in villages surrounding the city are considered to be the major factors responsible for polluting the air of Baoding. Another city in the Hebei province of the People’s Republic of China, Xingtai is the most polluted city in the country and the 9th most polluted city in the world. The air of the city has an annual mean PM2.5 of 128 micrograms per cubic meter. The primary reason for the high rates of pollution in Xingtai is smoke and dust generated from the large number of industries hosted by the city, especially the coal mines and coal plants. Other industries generating pollution in Xingtai include petrochemical industries, iron and steel factories, cement plants, etc. At the 8th position among the world’s most polluted cities is the African city of Barmenda in Cameroon. This city is also the most polluted city in the entire African continent. It has a PM2.5 of 132 micrograms per cubic meter. The city has a large number of agriculture-based industries, primitive waste management practices like garbage burning, and unregulated growth that have polluted the environments of the city. Raipur, the capital city of the Chhattisgarh State of India, is the seventh most polluted city in the world. Experts claim that the existence of three large industrial zones around the city is responsible for the maximum output of pollutants affecting the city. Sponge iron industries are held to be the primary culprits followed by other industries like power units and rolling mills. Many of these industries are poorly monitored resulting in careless maintenance of environmental standards. The growth in the number of cars in the city along with the clearance of vegetation for real estate development also further worsen the air quality of the city, loading the air with annual mean PM2.5 of 149 micrograms per cubic meter. Patna, the capital of the Bihar State of India is certainly not the best place to live in the country in terms of its poor air quality with a fine particulate matter concentration (PM2.5) of 149 micrograms per cubic meter. Respiratory diseases and cardiac trouble is thus on the rise in this city as per the claims of the city doctors. The high volume of road traffic and poor adherence to the governments laws on pollution control is considered to be the real culprits behind Patna’s low air quality. As per estimates, the number of vehicles in Patna rose by 78% within just a period of just 5 years from 5,16,000 in 2009 to 9,21,000 in 2014. A large number of vehicles that are over 15 years old and hence not in the best of conditions, also ply on Patna’s streets disobeying the laws of the region, emitting huge volumes of particulate matter into the air. 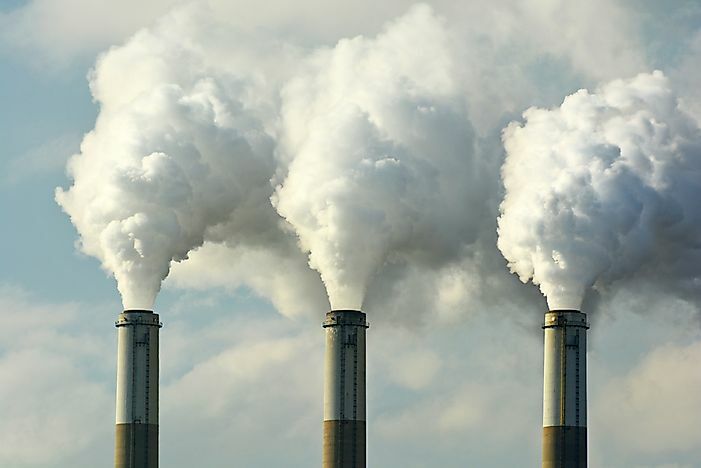 A city of the Kingdom of Saudi Arabia, Al Jubail, located in the Eastern Province of the country, is heavily polluted as per the latest figures released by WHO. The city has an annual mean PM2.5 of 152 micrograms per cubic meter. The existence of large-scale industries in the city releasing huge volumes of dust and smoke into the air is held responsible for the high pollution rates in the city. Al Jubail is considered to be the biggest industrial center in the entire Middle East and home to the world’s fourth largest petrochemical company. Riyadh, the capital city of the Kingdom of Saudi Arabia, is the world’s 4th most polluted country. The annual mean PM2.5 value of Riyadh is estimated to be 156 micrograms per cubic meter. According to the WHO, the pollutants released into the air by the heavy traffic of Riyadh as well as its large-scale industries is one of the primary reasons for the high levels of pollution in the country. Besides, the location of the city in the Arabian Desert region and the fact that it is frequently affected by desert sandstorms also worsens the air quality of Riyadh. Allahabad, an important place of pilgrimage in India and a densely populated city of Uttar Pradesh State of India, is also heavily polluted. Its highly toxic air is loaded with particulate matter with an annual mean PM2.5 value of 170 micrograms per cubic meter. Very little greenery survives within the congested heart of the city where buildings have been constructed in a highly unplanned manner and the narrow roads are also full of vehicles of all sizes with very poor pollution control measures being executed. There is also a lack of awareness among the common man regarding the need to save the environment which is further leading to a careless attitude towards the maintenance of pollution control rules and regulations in the city. With an annual mean PM2.5 level of 176 micrograms per cubic meter, Gwalior city in the Madhya Pradesh State of India is the world’s second most polluted city. Experts claim that the high levels of congestion in the city, with residential areas clustered together, and with very little green space, is one of the major reasons of pollution. The huge volume of traffic in the narrow and few roads of the city also often results in colossal traffic jams, releasing harmful automobile exhaust gases and toxic contaminants into the air. Doctors treating patients with respiratory infections claim that respiratory diseases like asthma, coughs, nose and throat infections and irritations and lung diseases are all on the rise among the citizens of Gwalior. Located at the border between Iran and Afghanistan is the Iranian city of Zabol, the most polluted city in the world as per the recent WHO rankings. The annual mean PM 2.5 level of Zabol is 217 micrograms per cubic meter, a figure way higher than the normal permissible limit of 60 micrograms per cubic meter. Zabol, a city stricken by poverty, also suffers from the phenomenon of “120 days of wind” during the extreme summers, when hot and dusty winds sweep across the city, hampering the daily activities of its citizens. The effects of climate change and drought have also dried up the wetlands of Hamoun near the city, which until the 2000s protected the city from dust-laden winds and acted as a natural air cooler. The loss of the wetland has also led to the loss of 700,000 jobs in the region, and the pollution has led to high rates of respiratory infections, including tuberculosis, among Zabol’s population. Which Ocean is the Most Polluted?